“I didn’t have a cellphone to call for assistance, and I had no idea how to change a flat tire” comes from a nice story that appeared here in the Winnipeg Free Press. “The only other people I saw were an elderly couple sitting on a nearby bench. I approached and asked if they had a cellphone I could use. They did, but we couldn’t get any signal, so the gentleman (in the finest sense of the word) volunteered to change my flat tire. Afterward, as I was thanking John and his wife, Millie, for their kindness, he told me he was 82 years old! I never would have guessed. 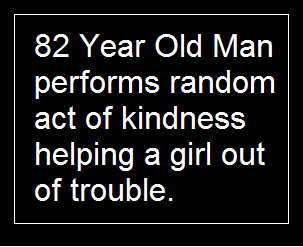 He’d been on his knees on the pavement, with a friendly smile, changing my tire. WOW.” A thank you. Read the story where she requests paying it forward.